Sometimes you might want to convert data that is not arranged neatly inside a table. For example, you may have a document with a scanned receipt on each page and you want to make a table containing a few scattered fields from each receipt. The best tool to use for such conversions is associated fields, which are fields that are set to be displayed next to only one table. You can set a field to be associated with a table by right clicking on that field and using the Show Field option. 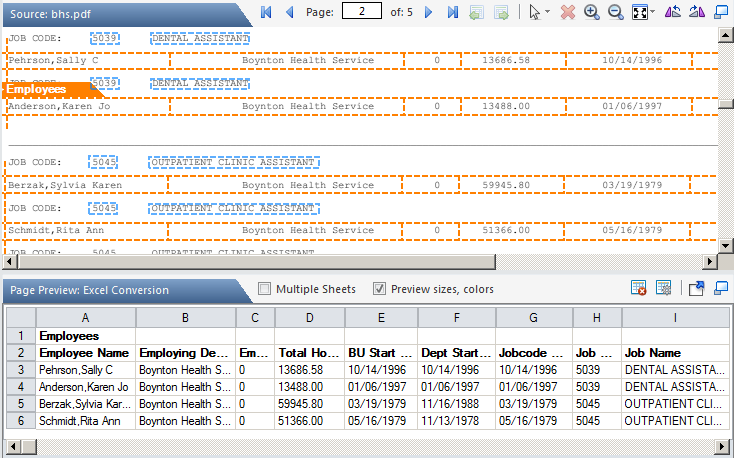 In the above screenshot, you can see a table that has been built out of many separate rows in the original document. Most of the columns in the output table are taken directly from the original tables, but the last 2 columns are taken from fields. Mark a table for the first record you want to include. This table will have only one row, and no header. Right click the table, select Edit Table Title, and give it a name (in this example: Employees). Mark the fields that you want to include in the table and are relevant to this record (in this example: the job code and position name above each row). Right click each of the fields, click on In Conversion, Show Field, then select With Table. If you have more than one table in your layout, select the correct one. If you want the table to have headers, you can now select each column in the table, right click and select Edit Column Headers to select names for each column. In a similar way, right click each of the fields and select Set Field Heading to select a name for the columns that will contain the values from these fields. You can now see the table in the preview pane, containing the first row including the data from the fields. Now that the first row is all ready, select the table and the fields connected to it. To select several elements, select the first one as usual, and then hold the Control key while selecting additional elements. After selecting the table and all fields, right click on one of them and select Copy Selection. Find the next record in your document, right click in its area and select Paste Here. To move the pasted table and fields to the exact position, hold Shift down while moving any of the elements and the rest of the selected elements will move together with it. Because the pasted table has the same Table Title as the original table, they will appear as one table in the conversion. Repeat the copying and pasting for all the remaining records that you want to convert.